These days, consuming news online has never been easier — or more overwhelming. It’s like the scene from Star Wars where everyone’s stuck in that space trash compactor. We’re up to our knees in news — with more coming all the time — and it’s hard not to get crushed by it all. Over the last few years though, both readers and news organizations have found relief in what some could argue is a dated news practice: The newsletter. “At a time when lots of news and information is whizzing by online, email newsletters — some free, some not — help us figure out what’s worth paying attention to,” writes David Carr in The New York Times piece, For Email Newsletters, a Death Greatly Exaggerated. Newsletters have been around for a while, but recently media agencies have begun investing more resources in email to reach readers. The New York Times and The Washington Post have upward of 50 email newsletters each and constantly are expanding. Then there are smaller newsletters, like Seattle’s The Evergrey, that forge to connect with a local audience about city-specific news. Publications large and small have found success with newsletters because they can share accessible, relevant, and finish-able information with readers. By using email, these news organizations can connect with readers in a direct and personal way. Reaching readers in their “living rooms” can help establish a community of loyal readers, which in turn can lead to an increase in paid subscriptions. 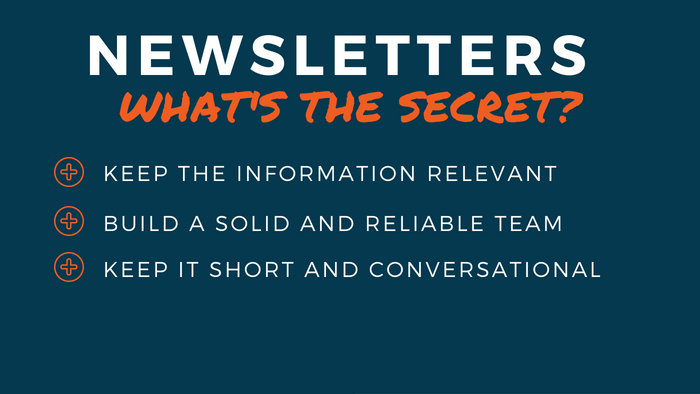 So, what makes a newsletter work? This year, the International Symposium on Online Journalism (ISOJ) held a panel that discussed the growing value of newsletters. Relevant information. Newsletters are successful when they provide relevant information for their intended readers. So it’s important to talk with your audience, or the community you want to reach with your newsletter. No matter how big or small the audience — find what they love, hate, what inspires them, and what gets them excited. Keep those things in mind when creating a newsletter. Capable and passionate staff. The panelists made it clear they all have strong teams behind them. But it’s not enough to be able to write. You’ve got to have passion, you’ve got to have expert knowledge, and you’ve got to be committed to good journalism. Conversational tone. Keep it short and personal. Don’t waste readers’ time, and do not betray their trust. They’re letting you into their personal inbox, and that’s a big deal. Like every trend, some believe newsletters and email eventually will fizzle and die. But even if that happens — there’s something to be said for a product that allows readers to incorporate news into their day without becoming entrenched or buried in content.